DRN is committed to restoring ecological function within the Delaware River Basin and improving management practices to guard against ecological degradation. Our Habitat Restoration Program, first established in 1992, provides Ecological Design servicesand partners with municipalities, agencies, local conservation groups, community groups and private property owners in producing restoration plans and implementing projects. These planning efforts and constructed projects improve water quality and infiltration, increase habitat value, restore native plant communities, improve stream function, improve resiliency, reconnect residents to their waterways, and improve health and well-being. DRN’s sustainable design approach includes guiding needed site improvements that enhance the recreational, cultural, and educational needs of communities, while improving underlying ecological function. Theprojects are integrated with DRN’s outreach and water quality monitoring capabilities to enhance sustainability over the long term. 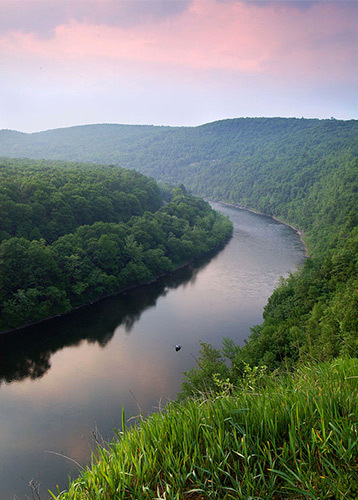 Our services are available throughout the Delaware River Watershed. Reverend Evers Park is a location where social justice issues are coinciding with ecological restoration to bring improvement to the community. DRN produced a park Master Plan addressing ecological issues, recreation and community garden facilities, and cultural/educational needs, with input from the local community and project partners. This Master Plan builds upon strategies provided by the Philadelphia University Landscape Architectural Department to the Morgan Village Circle Community Development Corporation, and lays out a clear action plan. DRN’s Master Plan guides green stormwater management, riparian improvements and sustainable site improvements for the park during phased implementation projects. DRN’s first phase of green infrastructure installation consisted of riparian corridor restoration, bioswale installation and park-wide tree plantings, supplemented with litter removal. DRN assisted with job training and led environmental educational outreach. 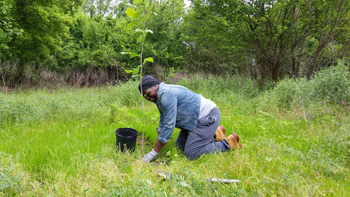 Partners have included the NJ Tree Foundation, Morgan Village Circle Community Development Corporation, and the City of Camden, and funding was provided by the National Fish and Wildlife Foundation, NJ Conservation Foundation, Wakefern Corporation, and the Foundation for a Better Tomorrow. For the degraded acres surrounding the Center, DRN prepared an Ecological Master Plan that includes riparian buffer restoration, woodland restoration, trails, vegetated swales and two rain gardens. The objectives of the project are to create an ecologically appropriate and beautiful landscape, improve circulation, improve storm water management and water quality, improve native plant diversity, and increase learning opportunities. Phase 1 was completed with the construction of vegetated swales, rain gardens, trails, steps, and a “learning circle”installedby volunteers, the township and DRN. Ongoing work includes monitoring and maintenance of the installation, supplemental seeding and plantings, and restoration of the wooded riparian corridor. Funded by the Wakefern Corporation, Haddon Township, and matching sources. DRN is working with Morrisville Borough and the Environmental Advisory Council to restore a healthy, native riparian buffer and provide public access at this 8-acre preserve along the Delaware River. DRN produced an Ecological Master Plan to guide the current and future restoration efforts and trail creation. Early in the process DRN provided technical assistance in the management of acres of Japanese knotweed that has been degrading the habitat of the buffer. The knotweed management has been followed with multiple tree plantings that are re-establishing native tree cover; trails have been established that have enabled ecological tours and enabledvisitors to enjoy the Preserve. Funded by the Bucks County Open Space Program, National Fish and Wildlife Foundation, PA DEP, PA Consortium for Scientific Assistance to Watersheds, and other contributors. In this highly developed watershed, the water quality is impaired as is typical of streams in many older communities. DRN and project partners are providing an assessment of existing green stormwater infrastructure as well as recommended improvements and locations for those improvements. This is being followed by outreach to the county, municipalities and residents to encourage adoption of additional green stormwater infrastructure improvements – often retrofit improvements because the watershed is virtually fully developed. DRN is working with the local watershed association and environmental groups during assessment and outreach, and is coordinating this project with ongoing water quality monitoring. Funding provided by the Camden County Municipal Utilities Authority. 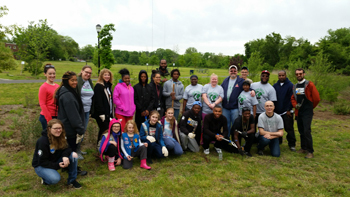 DRN and the school Green Team led the removal of invasive species from a degraded landscape area, and have begun restoration with diverse native plants. The project includes the installation of vegetated swales and three rain gardens, as well as a native meadow and “habitat garden”. The restoration project is adjacent to the school and it’s bird garden, is providing additional habitat enhancements beneficial to pollinators, and is useful for integration with the science curriculum. Funding for the technical assistance provided by PA C-SAW, and funding for phase 1 plantings provided by the Radnor Educational Foundation and matching donations. 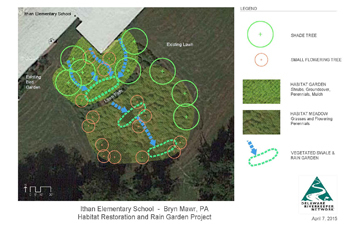 DRN provided restoration consultation for the riparian zone, and designed a 5,000 SF bioretention area in collaboration with the township engineer. Then the partnership led the bioretention area construction, and held two volunteer events where DRN led the removal of invasive species and installation of plantings in the buffer and bioretention area. The project has provided a beautiful and functional amenity which cleans and infiltrates stormwater runoff, while improving habitat along Peters Creek. Continuing work includes additional improvements to the buffer, and design of additional bioretention areas. Funding provided by the Borough of Audubon Park and matching contributors. DRN and partners designed a rain garden to collect and clean stormwater runoff from the main parking lot, and led the installation by the community group, volunteers and municipality. An engineered soil mix was installed, followed by diverse native plants. The robust design handled torrential rains on the weekend after installation, and continues to function by cleaning and reducing stormwater runoff. Funding provided by PA C-SAW, a WREN grant, and matching funders. DRNwith its partners developed a Stormwater Management Master Plan, and designed and constructed a 15,000 square foot bioretention system to clean, slow and reduce stormwater entering Saddlers Woods, a preserved 25-acre woodland with historical significance. Under pre-project conditions, elevated levels of stormwater runoff have been causing instability of the headwater streams flowing through Saddlers Woods, causing erosion, resulting in extensive downstream sedimentation. Design has begun on the next phase of restoration – an eroding tributary. Funded by NJ DEP and matching sources. DRN, with project partners and the property owners,developed ariparian restoration design and led the installation along 1,500 linear feet of Swamp Creek at the Erwinna Covered Bridge. Using natural channel design principles, the implemented design utilizes bioengineering techniques to stabilize the stream banks and establish a diverse native riparian corridor. Follow-up monitoring and maintenance is being provided by DRN and local partners. Funded by PA DEP and matching sources. DRN with project partners is developing a holistic plan to manage stormwater and ecologically enhance this 7-acre woodland, creating habitat uplift while creating a peaceful park for residents to enjoy. Designed measures will meet the community's need for stormwater management, woodland and wetland restoration, wildlife observation, passive recreation and ecological learning. Funded by Radnor Township, PA C-SAW, and matching sources. DRN, with project partners, designed and constructed a biofilter wetland along the Cooper River to reduce non-point source pollutants reaching the river. DRN has continued monitoring and maintaining the site with the help of volunteers, removing invasive species andreplanting with native trees and shrubs. An additional tree planting was conducted on the opposite river bank at the Camden County Boathouse. Recent efforts of this project were funded by the Fish and Wildlife Service, Camden County Municipal Utilities Authority, and Cooper River Watershed Association.